There are a number of things happening this month, so make sure you read through all of the articles in this month’s newsletter for the details. You can still sign up for a Super Saturday class, it’s a fun day and a great bargain. There is also room on the Lancaster trip, lots of quilts to see and shopping to do. We have exciting speakers and workshops coming in March and April – sign up for a workshop. Don’t forget quilt registration is open. Register your quilt early. Our February meeting will also be busy. This year’s Challenge quilts – Quilts Inspired by Doors – will be on display. 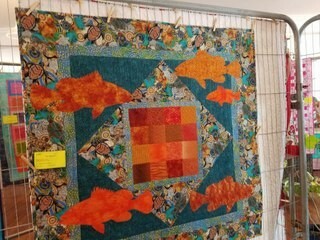 Come and vote for your favorite quilt. Also, back by popular demand we will be holding the Ugly Fabric Auction. If you missed last year’s event, make sure you come this year, it was lots of fun. Don’t forget to bring your dollars! 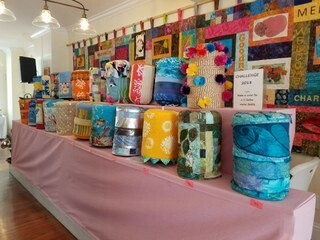 Finally, I just returned from the Bahamas, and I was excited to see as we drove into town that the local guild, Stepping Stone Quilt Guild, was holding their quilt show. Naturally, I had to add it to my things to do. It was fun to see what people do in other parts of the world. Their quilts were very nice and often reflected a Caribbean theme. I was particularly amused by their guild challenge, quilting a cover for a 5 gallon water jug.